WINNER: The winners will be randomly chosen from comments received on DT member blogs. The winners will be announced on the CDS blog Thursday, August 22nd. Thanks for another fun blog hop. Off I go to see what wonderful things everyone has created to share today. Great blog hop though I wasn't able to find a couple of the cards for it; guess I'll check back later. First time I've joined in on your blog hop and glad I did. Lovely projects by your contributors - although I couldn't find anything on Sarah's blog. Like the theme. I'm a dog person. Just got back from walking my dog this morn. My dog thinks he is part Cougar. Even though he thinks he is a beast he listens when I tell him to sit & paws down so he does not get rowdy when another dog comes near. I checked yesterday and missed it. Trying again today. Tried and tried but couldn't leave a comment on Linda Anderson's blog. Her cat card was just wonderful and I wanted to tell her so! Oh well! I love your theme for this blog hop because who can resist a dog or a cat? Not me! 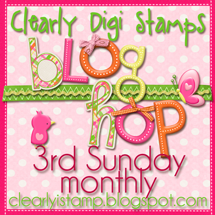 Cute images highlighted on this way too short blog hop! The girls did a wonderful job! What an awesome idea for a hop and the DT really did a wonderful job! This would be a fun challenge to just to see how many dog and cat lovers are out there. Haha!